I find that a lot of people have misconceptions about canning. They may have seen their parents or grandparents canning and they remember it being this HUGE ordeal that took all day and was major work. Or maybe they have never seen canning, but have read about it. And it sounded really complicated or even scary. Well, today I want to address some of those concerns – because honestly, they are really myths. In this podcast episode (and in the show notes summary below) I dive into the common myths of canning and what the reality is. 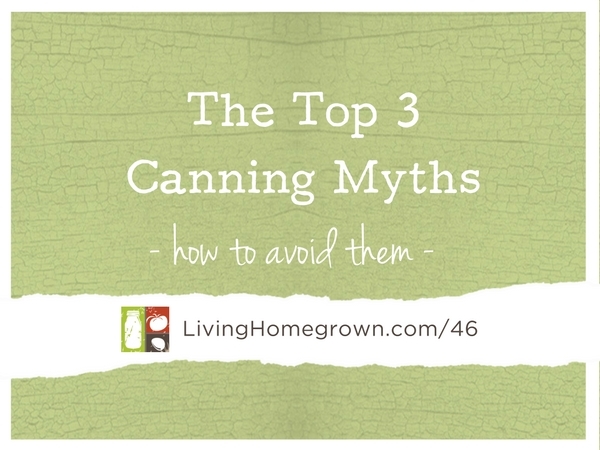 The reason I want to address the most common misconceptions about canning is because I don’t want those myths to hold you back! I don’t want anything to get in your way of living a more flavorful or sustainable lifestyle. And knowing how to preserve food can play a really important role in that lifestyle. For me, canning is about the flavor and fun of crafting artisan preserves. I don’t want you to miss out on that! I see this myth hold people back all the time. They think that canning involves expensive or fancy equipment. When in reality, needing specialized equipment is only true for the more advanced type of canning – pressure canning. 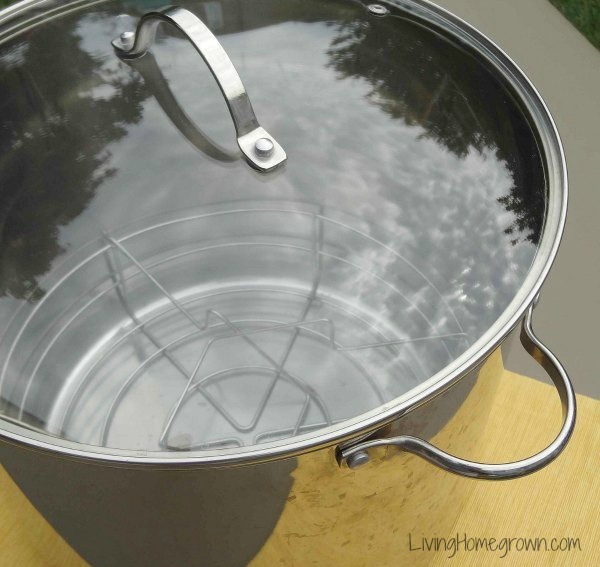 If you start with water bath canning, (which is where you should start if you have never canned before) then you don’t need anything but a tall stockpot with a rack in the bottom. If you dive into water bath canning, you can make things like jam, jelly, marmalade, fruit preserves, pickles and acidified tomatoes. That is a pretty wide margin of foods to put up! The reality is – Canning is not expensive if you stick with water bath canning. Your biggest investment is in your canning jars. And they last a lifetime if you care for them properly. After you get that under your belt, you can always step up your game with an investment in a pressure canner. But you should not start there. I can see where this comes from. It harks back to the image of pressure canners again. Pressure canners look intimidating with those heavy lids covered with knobs and gauges on top. They absolutely look complicated! But water bath canning uses nothing more than a tall stockpot (called a canner) with a rack inside that holds the jars off the bottom. Simple and efficient. So that eliminates that worry that the equipment is complicated. However, even in water bath canning there is a misconception that the act of canning is complicated. Water bath canning is just like cooking. And just like cooking, there are some complicated recipes and there are simple recipes. Any good chef worth their weight can take really simple ingredients and create a masterpiece. Well, the same is true in canning. 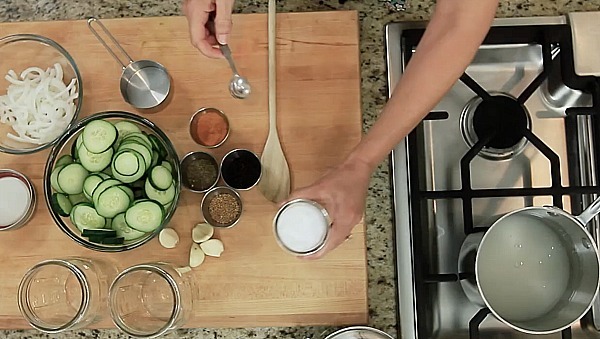 With just a few tricks under your belt, any simple recipe can taste amazing. And honestly, most canning recipes are just simple recipes that can truly knock your socks off. A beginning cook might not want to start off making a chocolate soufflé from scratch. But they could certainly pick something simple like a baked apple. And they could learn how to showcase that homegrown apple flavor with just the right spices and some time in the oven. That apple is suddenly its own masterpiece because the flavors of that apple are the star…not some fancy soufflé technique. The same is true in water bath canning. It is a beautifully simple process that allows YOU to showcase the flavors of SEASONAL produce. I don’t want you to miss out on that by thinking canning is complicated! The reality is: If you can follow a simple recipe, you can put up food. You just need someone to show you the chef tricks to make it amazing. This harks back to images of our parents or grandparents canning food. Back then, people had one goal when canning – stocking up! They would process large batches of food and it was an all day thing. It was hot sweaty work in the middle of summer. But today, that is not the only thing that canning is all about. Yes, you can and should preserve the harvest and stock up your food. But it is not the only reason to can. A lot of my canning is done for flavor. THAT is my goal. The act of creating preserves is a creative outlet for me and the fact that I also stock up my pantry at the same time is an added bonus. Sure, I get really into canning to preserve my harvest. I’m homesteader and I need to preserve that extra bounty. But I want to point out that if you are not a homesteader, you can still can food just for fun and know what is in your food. If you want to avoid the feeling of running a marathon, then pick simple recipes and do smaller batches. You don’t have to create 15 jars at a time. If you wish, you can create just 2 jars of handcrafted, seasonal deliciousness. Also, recipes do NOT have to take you all day. If you have a longer recipe, you can break it up into chunks and do it over two days instead of one long day. If you have never canned before, I want to give you a little taste of what you can accomplish without ever breaking out a canner. In fact, with this recipe you don’t need pectin or even a lot of time. We are going to blow these myths right out of the water! Below, I have a PDF for a simple refrigerator jam (which is just a jam that is not canned). It is a small batch jam that you can whip up in only 20 minutes and store in the refrigerator. The downside is that because it’s not “canned”, you must eat it within 2 weeks – But that’s probably not really a ‘downside’, now is it? But if you try this and you like the experience of making a quick, easy jam, then you might want to move into learning how to process that jam so it can store on the pantry shelf for a year. Think of this jam as the gateway drug to preservation – but in a good way! And yes, I know it is not blueberry season. This recipe uses frozen blueberries and will show you how just a few simple ingredients can make something delicious. No pectin boxes to open. No canner to fill. Just a simple jam, made with a few flavor enhancers you probably already have in your kitchen. Give it a shot and if you want to dive in all the way, my Canning Academy® is opening its doors for the Spring Session in just a few short weeks. I only open the doors a few times a year. This will be it for awhile. CLICK HERE to be notified when that happens so you check it out to see if you might be interested. In the meantime, enjoy the jam! Canning Academy – the doors are opening soon for the Spring session. Looking for a recipe for guava jelly. What I love about canning: no matter what time of year it is, no matter how bad the weather is, I can go to the basement, and bring up a jar of summer! Awesome! I’m getting a bunch of grassfed beef this week and wondering how to clear some space in the freezer. I was just looking at one of my bags of frozen blueberries and wondering what I could do with all of them. Of course I did start laughing right away when reading this post because, of course, when I started with canning, I went right to pressure canning. Haven’t done a whole lot. Canned some potatoes and while it worked fine probably won’t do it again….just doesn’t seem like something that needs to be canned. And I’ve canned homemade chicken and beef stock. THEN, I tried water bath canning and have some nice pear sauce. Definitely want to try more things!! Ha ha Barb – yes, I just find the expense and the intimidation of starting with pressure canning stop most people. But there is certainly nothing wrong with starting there. The important part is just starting somewhere! Thank you for the blueberry jam recipe and the easy instructions that gave me the confidence to try.. Fantastic Laura – glad you are diving in! I guess I’m looking for a new fig recipe. I made 3 different batches of low sugar and the set is so hard! I really like a softer set jam. Any suggestions? Oh and the blueberry one is scrumptious!!!! Oh, one more thing! 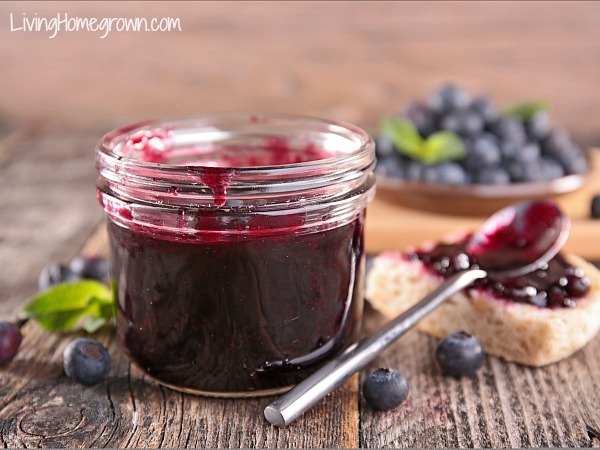 Can the blueberry refrigerator jam be water bath processed? Any adjustments? Can the blueberry jam be frozen? I love freezer jam because it tastes so fresh. I just saw you on Growing a Greener World, my new favorite show! Hi Vicki – I have not tried freezing the jam myself, but I see no reason why that wouldn’t work. Go ahead and give it a go! Glad you like GGWTV!